Originally published in Dayton Daily News. May 15, 2016. 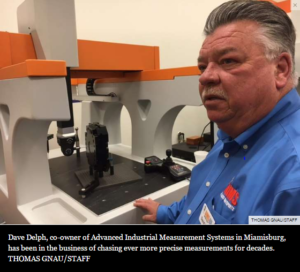 MIAMISBURG – When companies need a part built, they turn to Dave Delph, who has been in the business of precise measurements for decades. Since 2009, Delph and his partner Mark Gearding have built their own coordinate measuring machines business and carved a small but growing niche in the field of metrology – measuring machined parts for aerospace, health care, automotive and other customers. Two years ago, their company – Advanced Industrial Measurement Systems or AIMS – moved from Beavercreek to a larger space in Miamisburg. Since then, they have invested $1.2 million into their Kohnle Drive building, offices and labs. With $8 million in sales last year, AIMS is poised to hit $11 million in sales this year, Delph predicted. AIMS machines range in price from $70,000 to $500,000, depending on how big they are and how well equipped. “This is the second expansion here,” Delph said. Offices, assembly areas and climate-controlled labs have been built out for a growing business. In the past year, the company designed two new coordinate measuring machines that use technology from England. 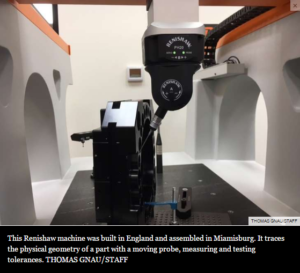 AIMS – with 23 total employees and 16 local employees – takes hardware and controls built by Renishaw in England and assembles them in Miamisburg. They are sold to customers across the country and in some cases, in other nations. 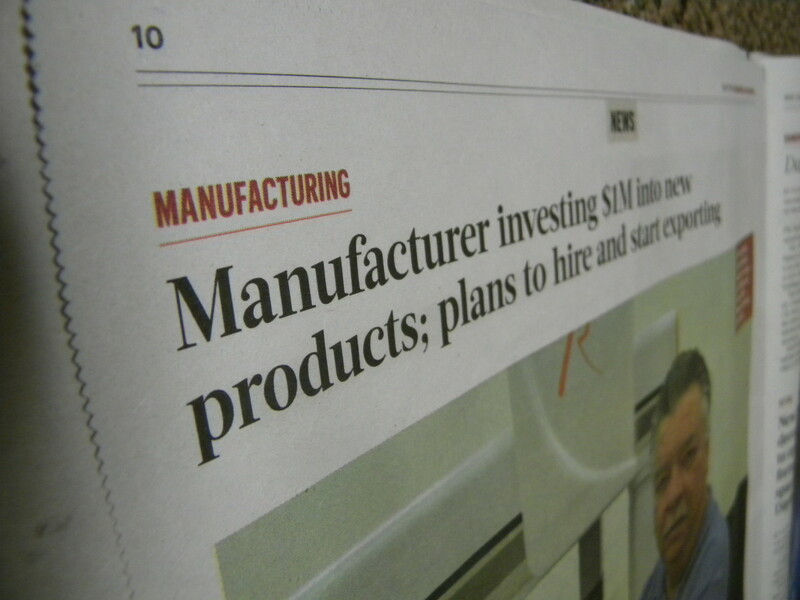 But the company also uses castings made in Franklin and parts made in Dayton and Cleveland. And AIMS is shopping around to acquire a Dayton tool and die shop. In three years, he thinks AIMS could be a 60-employee business. “There’s a tremendous amount of experience around Dayton in tool shops,” Delph said. Metrology – the design, manufacture, assembly, installation, calibration and programming of measuring machines – is not new to Dayton. Sheffield Measurement is now a product line for Hexagon Manufacturing, but it used to be the name of a company in Dayton, a company with 1,400 employees at one time. Delph was once one of those employees. He declined to name many of his customers, but one name he was comfortable sharing was Metaldyne, a maker of transmission parts. That company has purchased some $2 million of measuring machines from AIMS, Delph said. “Service and support are what this comes down to,” Delph said. Delph and Gearding were competitors when Delph asked him to consider banding together to start their own company. Gearding was happy where he was, though. Delph warned him he would never get an order against him. Soon thereafter, they were partners. Gearding now oversees outside sales at AIMS. Please support Dayton Daily’s official news article by clicking here.